Passengers aboard the stricken Carnival Triumph cruise ship were photographed spelling out 'HELP' with their bodies for passing helicopters. Travelers on the stranded vessel have reportedly been enduring disgusting conditions for days. The Carnival Triumph has been adrift in the Gulf of Mexico since Sunday, when a a fire in the engine room damaged the ship's propulsion system. Passengers told CNN earlier this week that sewage was running down the walls and floors. 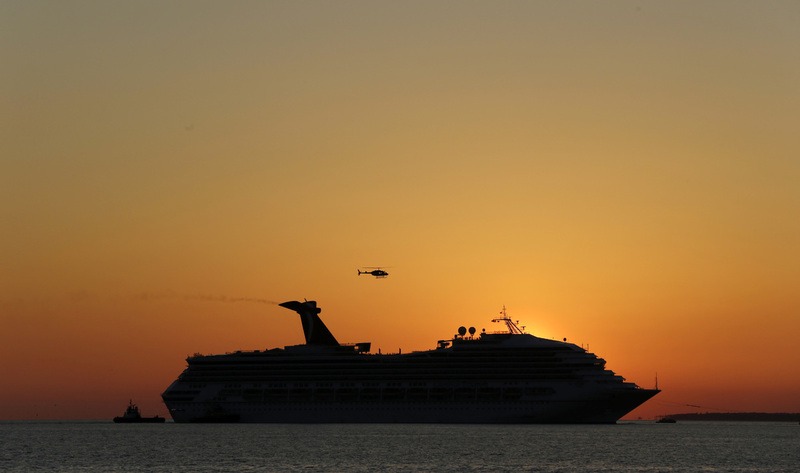 The Carnival Triumph has encountered further troubles as it has been towed back to the United States. A Carnival official said late on Thursday that a snapped towline has delayed the Triumph's expected arrival in Mobile, Alabama.